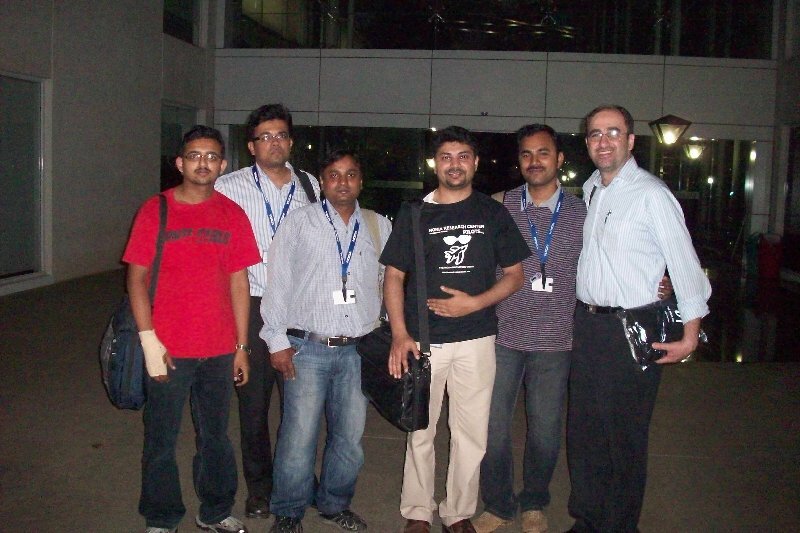 As we waited for the known TED Fellows to some by at the Bangalore International Airport, we bumped into Pranav Mistry, the Indian MIT geek superhero, responsible for the Sixth Sense device that may hit us soon. Recollected the TED Video of Pattie Maes I saw a few days back showcasing the remarkable device. Also exchanged Smiles with Kabir Bedi as he was rushing for his flight, with a quick "Hi" shoutout! 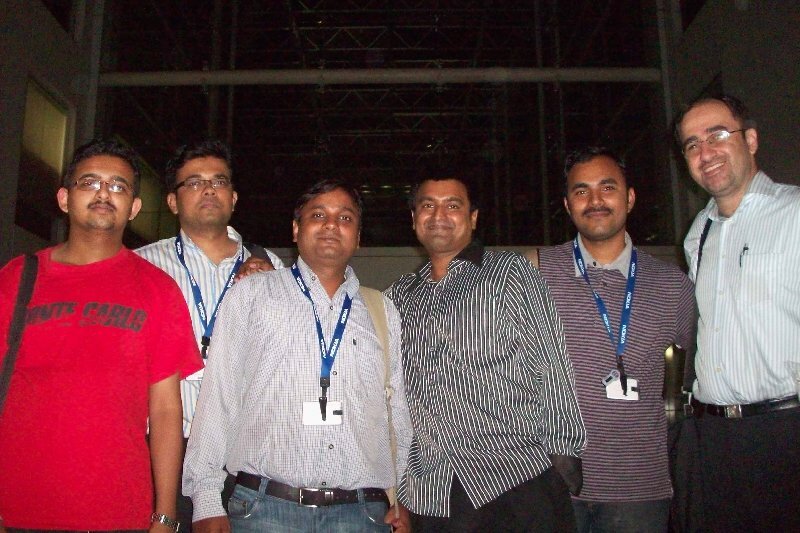 Same memorable snaps with the Stalwarts, right here. Thanks to Songita and Hrish, I was invited to the Forum Nokia Bloggers Meet. A small entrant among the experienced biggies, I walked in late as I missed my way. 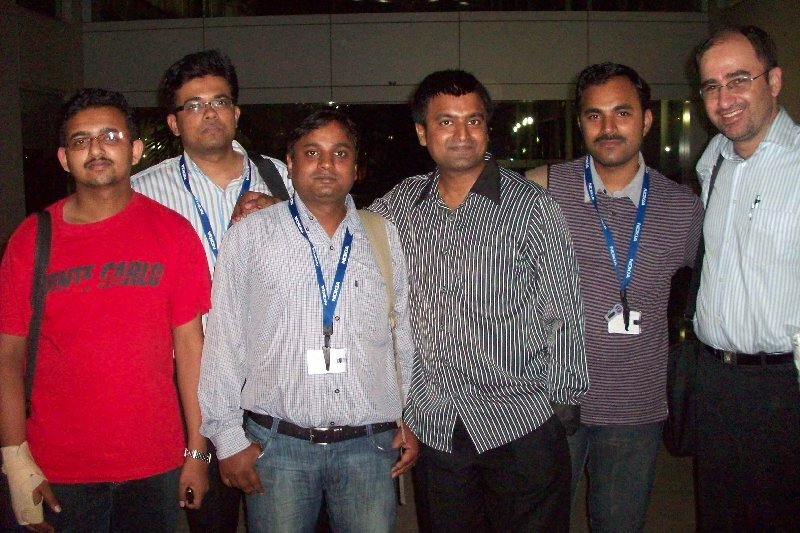 Promptly greeted by Praveen Karoshi from the Nokia Developers team was introduced to the app 'WeMeet' by his friend. Pretty cool app, especially for the college kids and SMS freaks, one can send as many SMSes as possible to a group of Nokia Mobile users among friends and still be charged for just one SMS. As strange as it sounded, I did realize that t was all courtesy Nokia's relentless research on this Java app and it was a Pilot release of the beta version. I waded my way through a few small groups catching up, shaking hands and exchanging smiles with everyone who smiled back. I reached the big man and star of the event Mohammed. Very charming guy as he was, he was patiently listening to all the WOWs and Brickbats with the same enthusiasm. With ideas brimming my braincells, I started a conversation with Mohammed, about how we could tag all the Social Networking IDs together to one's 'WeMeet' ID and when updated the message could go to all their friends on either networks. It also would mean one did not have to reveal his Mobile number and yet welcome incoming messages. Another advantage, I saw was of employing a unification tool online which would link all the Social Networking Unique IDs / Vanity URLs to one's WeMeet account and enable conversations and planning among fiends, colleagues and group mates. This would help coordinate and plan trips, events, meetings and even casual get-together via just a couple of messages and reach out to one and all on one's friend list. Out to catch a glimpse of the Stalwarts of Social & other Media Tweeple returning from TED India, Hrish and I, went to the Bangalore International Airport for a quick chat. While we were expecting the Tweeps to arrive, I got itchy to click a few snaps while Hrish was Tweeting away on his Blackberry phone. Here are some pretty pics. Comfortably numb after a few drinks, and out to check about Twestival payments with Kyra, we (@dhempe and @brandbull) chose to take the walk bridge at Indiranagar 100ft Rd entrance. Camera in hand was quite a temptation to take snaps and here is what we could manage to click. Hic! 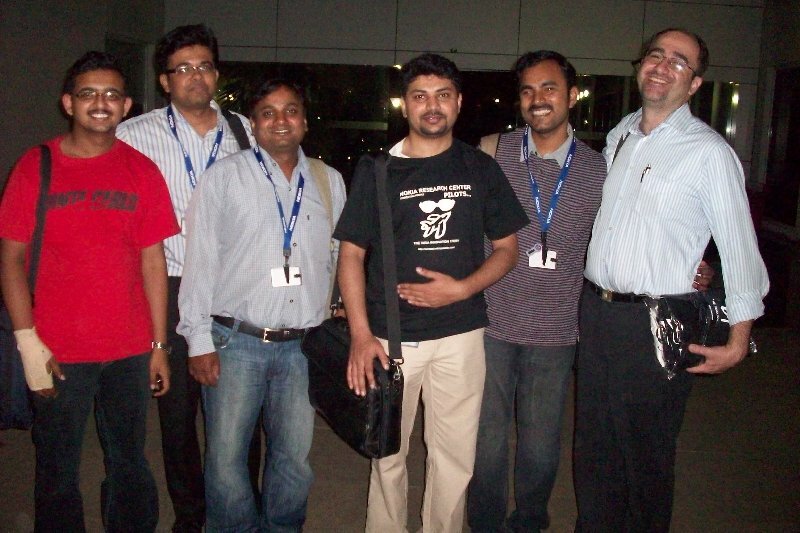 One of the first Tweetups, I discovered hanks to Hrish (@dhempe) and was at. Was visiting the 13th Floor after quite a time. Seated in open air and a corner table for comfortable commotion generation, the place was absolutely amazing with delicious short-eats and beer flowing by. @gauravonomics, @pkjohn, @plasmadog, @chikodi, @NetikaR, @fossiloflife, @dhempe, @santoshp, @brandbull, Rachael (the TEDIndia chief's secretary), and a couple more friends, I fail to recollect names or handles of, all enjoyed the gala and chatter amidst our varied choice of drinks and eats.